Une publication internationale d’Arnaud Foisy et de ses collègue d’IRIS team, (Physiopathologie de la Vision et Motricité Binoculaire, FR3636 Neurosciences CNRS, Paris, France C. Gaertner, E. Matheron et Z. Kapoula) dans PLoS One (décembre 2015). Dans la continuité des travaux princeps sur la relation entre les pieds et la perception visuelle de nos amis Jean Pierre et Régine Roll et de ceux d’une de nos consoeurs qui a enseignée longtemps avec nous : Patricia Desenne aidée d’une orthoptiste, Arnaud a démontré scientifiquement, ce que les cliniciens constatent quotidiennement, l’effet des stimulations plantaires (≤ à 3 mm) sur la régulation posturale et l’oculomotricité (vergences). Roll JP, Roll R. From eye to foot: a proprioceptive chain involved in postural control In: Amblard B, Berthoz A, Clarac F, editors. Posture and gait: Development, adaptation and modulation. Elsevier, Amsterdam, 1988. pp. 155–164. PLoS One. 2015 Dec 4;10(12):e0143693. doi: 10.1371/journal.pone.0143693. eCollection 2015. Controlling Posture and Vergence Eye Movements in Quiet Stance: Effects of Thin Plantar Inserts. Foisy A1, Gaertner C1, Matheron E1, Kapoula Z1. The purpose of this study was to assess properties of vergence and saccade eye movements as well as posture in quiet stance, and the effects of thin plantar inserts upon postural and oculomotor control. 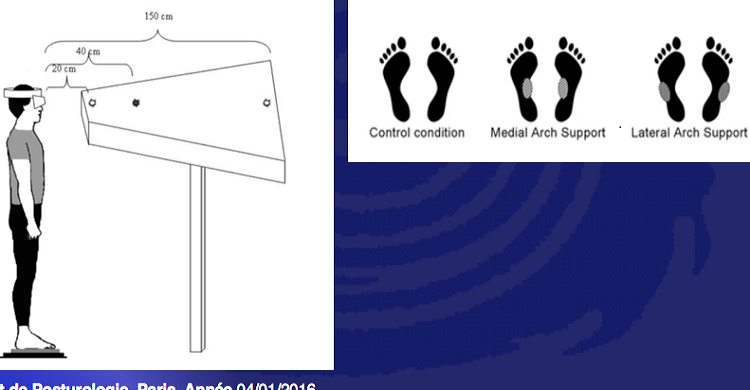 The performances of 36 young healthy subjects were recorded by a force platform and an eye tracker in three testing conditions: without plantar stimulation, with a 3 millimetre-thick plantar insert, either a Medial or a Lateral Arch Support (MAS / LAS). 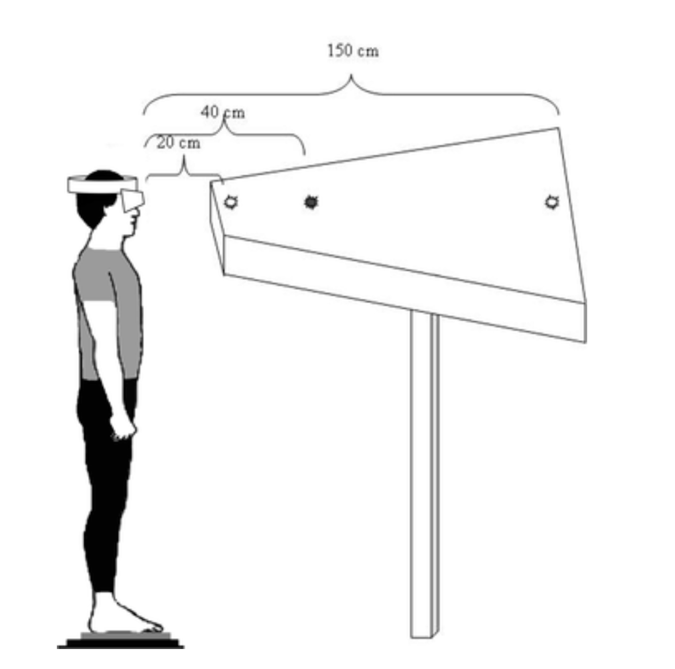 The results showed a decrease of the Surface and Variance of Speed and a more posterior position of the CoP with either stimulation compared with the control condition. The fractal analysis showed a decrease with MAS. Wavelet analysis in the time-frequency domain revealed an increase in the Cancelling Time of the low frequency band with MAS. These results suggest a better stability for a lower energy cost. Concerning eye movements, the inserts influenced only vergence (not saccades): MAS caused an increase of the phasic amplitude of divergence, and conversely a decrease of the tonic amplitude. In contrast, LAS caused an increase of the tonic amplitude of convergence. Thus, MAS renders divergence less visually driven, while LAS renders convergence more visually driven. We conclude that the CNS uses the podal signal for both postural and vergence control via specific mechanisms. Plantar inserts have an influence upon posture and vergence movements in a different way according to the part of the foot sole being stimulated. These results can be useful to clinicians interested in foot or eye. Partager la publication "Posture, Stabilité et Oculomotricité – Posturologie"